Wondering if you have enough room in your freezer? 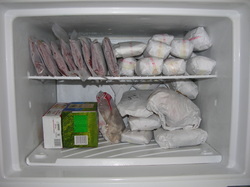 A good rule of thumb is you need 1 cubic foot of freezer space to hold about 35 pounds of wrapped meat. This picture shows a refrigerator freezer on the top. It is pretty small as freezers go at 4.96 cubic feet. I have about 32 pounds of meat on the top shelf alone, and it's not even full. You do want to make sure there is room for air to circulate if you are going to keep it in there for a while. Oh, and make sure it's stacked so it doesn't fall out when you open the door. A two pound frozen roast on the big toe hurts for months, trust me.